Trinity Lutheran threatens to obliterate the divide between church and state. The Supreme Court’s ruling in Trinity Lutheran v. Comer threatens to obliterate the divide between church and state. 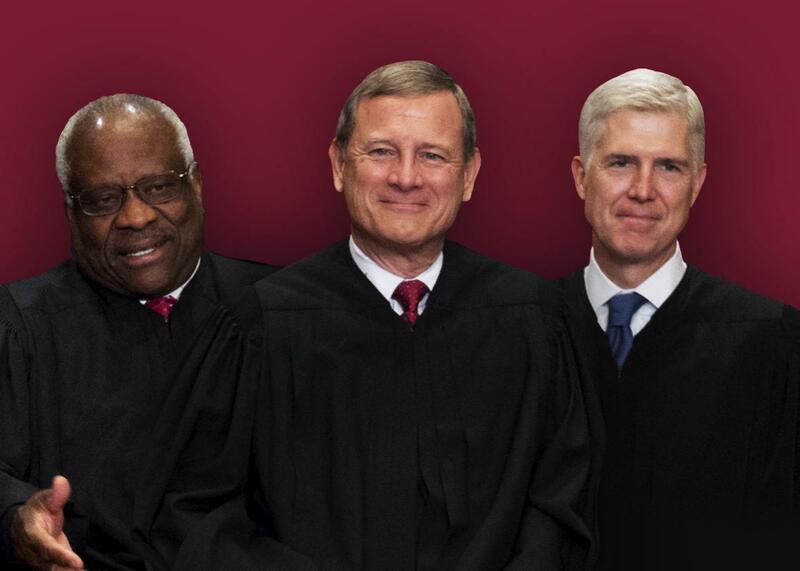 Supreme Court Justice Clarence Thomas, Chief Justice John Roberts, and Justice Neil Gorsuch. Does the Constitution sometimes obligate states to subsidize religion? On Monday, the Supreme Court said it does. According to the court’s 7–2 ruling in Trinity Lutheran v. Comer, when a state makes a funding program available to the public, it cannot deny funds to a church because of its status as a religious organization. This sets a dangerous precedent, one that betrays the court’s historical commitment to true religious freedom and threatens to obliterate the divide between church and state. The facts of the case are simple. Trinity Lutheran Church owns a “Learning Center” that is used “to teach the Gospel to children.” The learning center’s facilities include a playground that is, in the church’s words, part of “an education program structured to allow a child to grow spiritually, physically, socially, and cognitively.” In 2012, the church applied for a grant through Missouri’s Scrap Tire Grant Program to help pay for playground resurfacing. The state rejected its application, citing a provision of the Missouri Constitution that bars the use of taxpayer money “in aid of any church, sect, or denomination of religion.” Trinity Lutheran sued, alleging a violation of its Free Exercise rights under the First Amendment. In his opinion for the court, Chief Justice John Roberts held that Missouri had run afoul of the Free Exercise Clause by denying Trinity Lutheran a “public benefit solely because of [its] religious character.” According to Roberts, the Missouri rule “puts Trinity Lutheran to a choice: It may participate in an otherwise available benefit program or remain a religious institution.” This “clear infringement on free exercise,” he asserted, “is odious to our Constitution.” Thus, Trinity Lutheran must be allowed to compete in the scrap tire program. To limit his holding, Roberts drew a distinction between religious status and religious use: Missouri, he explained, had discriminated against Trinity Lutheran “simply because of what it is—a church,” not because it feared the grant money would fund religious exercise itself. He also noted in a footnote that the case “involves express discrimination based on religious identity with respect to playground resurfacing. We do not address religious uses of funding or other forms of discrimination.” This stipulation is meant to strike a tone of compromise. But it doesn’t change the fact that, at a minimum, Trinity Lutheran opens the public funding floodgates for houses of worship and religious schools. Put simply, Gorsuch and Thomas see Trinity Lutheran as an opportunity to expand the place of religion in public life by creating a one-way ratchet that allows churches ever-increasing access to public funds while giving religious exercise primacy over laws of general applicability. In her forceful dissent, Justice Sonia Sotomayor gave her colleagues a necessary reality check. (Sotomayor was joined only by Justice Ruth Bader Ginsburg. Justices Elena Kagan and Stephen Breyer both voted in favor of Trinity Lutheran; Breyer wrote that a public benefit designed “to improve the health and safety of children” is akin to “ordinary police and fire protection” and, as such, cannot be denied on the basis of “faith.”) “Properly understood,” Sotomayor wrote, “this is a case about whether Missouri can decline to fund improvements to the facilities the Church uses to practice and spread its religious views.” In fact, Sotomayor explained, Missouri must decline to fund these improvements under the Establishment Clause of the First Amendment, which forbids states from using public funds to underwrite religious exercise. “By the church’s own avowed description,” Sotomayor wrote, the learning center’s facilities “are used to assist the spiritual growth of the children of its members and to spread the Church’s faith to the children of nonmembers. The Church’s playground surface—like a Sunday School room’s walls or the sanctuary’s pews—are integrated with and integral to its religious mission.” Therefore, funding the learning center through the scrap tire program “would impermissibly advance religion” in violation of the Establishment Clause. Sotomayor’s dispute with Roberts is, in many ways, a factual one. Roberts believes that Trinity Lutheran’s playground is divorced from its religious mission; Sotomayor argues that it “cannot be confined to secular use any more than lumber used to frame the Church’s walls, glass stained and used to form its windows, or nails used to build its altar.” Put differently, the two disagree about why Missouri turned away Trinity Lutheran: Roberts thinks it’s because of the church’s status as a house of worship; Sotomayor thinks it’s because the church would put its grant to religious use. There’s nothing wrong with stained-glass windows or mikvahs or minarets or religious schools. The problem occurs when the state is forced to foot the bill. For decades, courts have interpreted the Establishment Clause to proscribe public funding of religious activity. Now, Gorsuch and Thomas insist that the Free Exercise Clause requires public funding of religious exercise, Establishment Clause be damned. This radical revision of First Amendment jurisprudence would ensure that every American who pays taxes is helping to subsidize religion—a threat the Establishment Clause was designed to guard against. Sotomayor rebuked Gorsuch and Thomas in a single footnote, quoting a famous 1963 decision that declared: “While the Free Exercise Clause clearly prohibits the use of state action to deny the rights of free exercise to anyone, it has never meant that a majority could use the machinery of the state to practice its beliefs.” That guarantee, once widely accepted, is no longer on stable constitutional footing. In Trinity Lutheran, the court held for the very first time that the Constitution mandates public funding of a church. The ruling will encourage more houses of worship to demand taxpayer money to enable religious exercise. In Sotomayor’s words, it reduces the separation of church and state to little more than a slogan. She’s right—but at least it is still a slogan. If Gorsuch and Thomas get a few more votes, the very notion of church-state separation may become obsolete.